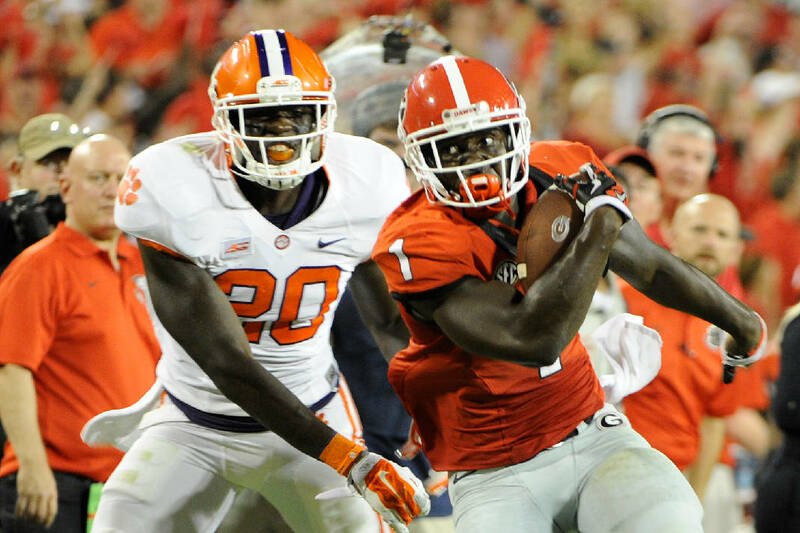 Georgia tailback Sony Michel had a quick start to his freshman season until suffering a fractured shoulder in the fourth game against Tennessee. Photo by John Kelley Jr.
As a five-star tailback in Georgia's 2014 signing class, Sony Michel was hoping to produce a lot of numbers early on. Michel did just that, averaging 6.4 yards per carry, 13.2 yards per reception and totaling six touchdowns last season. It's the two shoulder fractures in his short time with the Bulldogs that he could have done without. "It's definitely been a learning experience," Michel said. "I came in and gave it all I had. Life is full of ups and downs, and it was one of those years. Every year I will probably go through ups and downs, but I'm giving it my all and am not looking back." The 5-foot-11, 212-pounder from Plantation, Fla., arrived last summer along with Nick Chubb, a five-star talent from Cedartown, Ga. They erupted out of the gate and drew instant comparisons to Georgia's 2012 freshman duo of Todd Gurley and Keith Marshall. Chubb had a 47-yard touchdown run in last season's opening rout of Clemson, while Michel produced 33 yards on six carries and had 20 yards on three receptions in his collegiate debut. Michel had a 33-yard touchdown catch in the second game at South Carolina and then rushed 10 times for 155 yards and three touchdowns in the third game against Troy. In the fourth game against Tennessee, however, Michel left with what turned out to be a fractured left shoulder. Four games went by before his return Nov. 8 at Kentucky, where he rushed 16 times for 84 yards and a touchdown. Georgia had depth issues all season at tailback, largely due to Michel's setback and Gurley serving a four-game NCAA suspension and then tearing his ACL, but Chubb stayed healthy and plowed away for 1,547 yards and 7.1 yards per carry. Chubb enters this season on every Heisman Trophy watch list and Gurley now is with the St. Louis Rams, but Michel doesn't mind currently being out of the limelight. "That's nothing I focus on," Michel said. "I just go out and play. Things like that will come, but it's not a goal that you have. You just want to work hard as a team." Michel suffered a broken left shoulder again this spring, which caused him to miss 11 of 15 practices, including the G-Day game. He believes his shoulder pads may have contributed to his injuries and since has been fitted with a new set. "He's looking good," Chubb said. "We're all looking good." Chubb and Michel say they enjoy hanging out with one another, with Chubb preferring a low profile given the surrounding hype. Video games can be an escape for the pair, but Michael is quick to say, "Nick is a video-game guru. There are no battles. He's always winning." After a freshman season that yielded 64 carries for 410 yards and seven receptions for 106 yards, Michel is ready to do whatever role it takes to help the Bulldogs build on last year's 10-3 record. He knows that Chubb is the unquestioned starter and that sophomore receiver Isaiah McKenzie, a former American Heritage teammate in Plantation, is the favorite for the return duties, but he also realizes there are multiple ways in which he can make a difference. Michel proved that last season — when he was healthy. "I had a lot of fun," he said. "Whether I was hurt or I was playing, I had fun through the whole process." Georgia held its third practice Thursday but was forced inside by lightning. The Bulldogs conducted meetings before returning outside and working for 90 minutes in shoulder pads and shorts. "We did a lot of team work and some more installation, including extra points and field goals," coach Mark Richt said. "Overall, we got in what we needed."